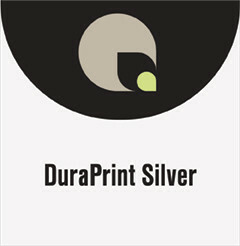 DuraPrint Silver is a high gloss, 5 mil, silver polyester film for maximum mirror finish, plus antistatic back-coat. This product is water resistant and is coated to accept eco solvent, latex and UV curable inks. DuraPrint Silver can be mounted to rigid boards (with Megabond C adhesive) for displays or hung for dramatic, eye catching effect.